The AWS834 wireless stereo headphone system is specifically made for MP3 / CD / Multimedia player, iPod and PC use. The AWS834 utilizes the state-of-the-art wireless digital audio technology to transmit and receive crystal-clear music up to 100 ft. distance even through wall and floors. It lets you sit where you like and enjoy freedom of movement without the hassle of wires while listening to music from PC, MP3 player or iPod. Auto mute function for suppressing pop noise. Transmission range up to 100ft. (L.O.S.,indoor) with perfect reception. Superior Signal-to-Noise ratio of 80dB or higher. Headphone design for 360 non-directional reception. Auto channel track and hold for the receiver. 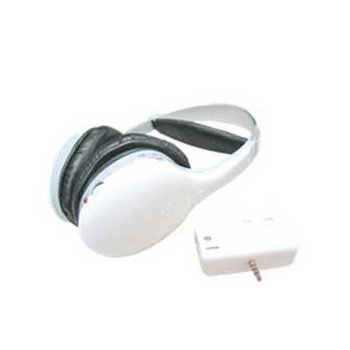 Closed ear-cup or closed on-ear style headphone with powerful heavy bass. Soft ear cushions for ultra-comfortable wearing. Dual audio inputs of analog Line-in and digital USB port on the transmitter. Rechargeable Li-ion battery included for the transmitter. Listening to music from iPod ,MP3 or CD players. Listening to music from Notebook or Desktop PC via either USB port or earphone output.